Capt. Ronnie and Capt. Ryan are a father and son operation. We are native Ocracoke guides. 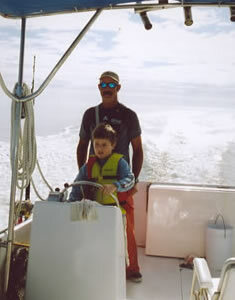 Our family of watermen date back to the 1600's on Ocracoke Island. Fishing is our heritage and we enjoy the chance to share it with you. We specialize in offshore fishing, inshore light tackle fishing, wreck fishing, and live bait fishing. We also specialize in family charters with children welcome. Both of us are U.S.coast guard approved captains. For Reservations and Info about "Miss Kathleen"
For Reservations and Info about the "Tarheel"